Six groups of Duke faculty have been awarded multiyear Research Collaboratory grants, and five groups have received one-year pilot research grants in the humanities and social sciences, Provost Sally Kornbluth announced. Part of the Together Duke academic strategic plan, these new grant opportunities provide flexible, immediate resources to strengthen Duke’s intellectual communities and help faculty groups move forward on both fundamental inquiry and solutions for real-world problems. The Offices of the Vice Provost for Interdisciplinary Studies and the Vice Provost for Academic Affairs oversee these seed grant programs. Collaboratory grants provide support for groups of faculty seeking to provide solutions to targeted problems in three areas: energy and water resources; race, religion, and citizenship; and population health. By drawing on its disciplinary depth, interdisciplinary strengths, and commitment to engagement, Duke has the capacity to make crucial research contributions in these vital arenas. Project funding ranges from $20,000 to $200,000 annually, with any related administrative work undertaken by an existing department, school, or interdisciplinary unit. Over time, thematic areas of focus will likely evolve. Unless greenhouse gas emissions are drastically reduced in the near future, society will be faced with severe climate change. Large-scale geoengineering, or climate engineering, has emerged as a potential approach that does not depend on emissions reduction. Two options are solar radiation management and carbon dioxide removal. Yet the cost and effectiveness of all geoengineering technologies remain highly uncertain. The various options may also pose risks of their own, including unintended climate effects, ozone layer depletion, changes in precipitation, and adverse effects on ecosystems and agriculture. It is even possible that turning to geoengineering may undermine efforts to reduce greenhouse gas emissions. This collaboratory will investigate the risks and opportunities associated with geoengineering as a climate change response strategy. It will also explore the policy issues that would need to be addressed if geoengineering were implemented. Infrastructure —our interconnected roads and bridges, sewers and water pipes, power lines and broadband networks—undergird communities and provide a foundation for economic growth. Although Americans widely agree that improving infrastructure should be a top government priority, the condition of the nation’s infrastructure is in decline. The model of infrastructure provision that has dominated for a century—local government responsibility, funded by quantity-based fees and financed with municipal bonds—seems outdated. We struggle to produce a robust network of facilities and services that equitably reaches all our residents and demonstrates resilience to the effects of climate change. This collaboratory will examine and promote innovative models of infrastructure provision and governance, using urban water as an entry point for investigating the conditions under which old infrastructure governance models have failed and identifying opportunities for new models to improve the safety, reliability, and affordability of water services. Researchers will partner with communities to apply a governance-finance-engineering approach to place-based problems. Issues related to race, religion, and citizenship sharply divide Americans. There is mounting concern that social media deepen these divisions by creating “echo chambers” that prevent exposure to people with different opinions. This collaboratory will develop app-based technology designed to disrupt echo chambers in order to reduce partisan conflict about race, religion, and citizenship. The project builds on a field experiment on Twitter that exposed a large sample of Americans to those with opposing political views in order to test whether such exposure shapes views about policy issues such as racial inequality and immigration reform. Researchers will identify how social media networks might connect people amenable to compromise, and produce a tool that all Americans can use to adjust the ideological bias in their networks and reduce polarization. The results will address theoretical and methodological questions that cut across multiple fields, provide a unique opportunity for Duke students to receive training in computational social science, and help community organizations to publicize the tool broadly with the goal of fostering greater ethnic and religious cohesion. This collaboratory will conduct and commission original research on how transformations in racial and class demographics, economic development, and the legal landscape have reshaped the American South in politics, culture, health, education, wealth, and family and community structures. Over the past half century, the South, always a distinctive and critical crucible of national trends, has undergone dramatic change. No longer a “cultural and economic backwater,” the region is now home to the nation’s largest bank and three of the largest airlines. Research parks in Raleigh-Durham, Huntsville, and Austin define the cutting edge of new technologies. In this transforming South it’s now commonplace to see African Americans and women in elected offices, and as leaders in education and business. Despite all these changes, it has been more than 50 years since the last series of seminal academic studies sought to assess the state of the South. This collaboratory will fill this vacuum by reexamining findings and conclusions from earlier research and by generating new knowledge, and perhaps new understandings, of the American South. Aligned with the goals of Healthy Duke, this collaboratory will launch a hybrid population health/research and educational initiative to promote health awareness and engagement, establish healthy behaviors, and enable student-centered research and learning opportunities. The goal is to develop and pilot a campus initiative to promote healthy living through student engagement with wearables and novel learning opportunities and activities. Following a year-long planning phase, researchers will conduct two pilot projects initially focused on sleep behaviors. The first pilot will assess the feasibility and acceptance of using a wearable with a companion app to record sleep habits; incoming first-year students from a single residence hall will be invited to participate. Among the preliminary outcome measures will be perceived value of the wearable, number of sick days, psychological well-being, and academic performance. In the second pilot, researchers will evaluate a range of educational interventions comparing sleep behaviors over the year in students provided with several different educational interventions to improve sleep habits. The pair of pilot studies will provide the infrastructure for a scalable, campus-wide precision health program that can be introduced to entire future incoming classes. Health disparities in the U.S. will likely continue to widen and the costs of care will continue to increase unless key innovations are leveraged to improve access to efficient screening, diagnosis, and treatment of disease. For example, cervical cancer prevention is based on well-established interventions including HPV vaccination and screening followed by treatment of preinvasive disease. In the U.S., cervical cancer incidence and mortality have decreased by 70% over the last 60 years; however, women living in medically underserved regions experience a disproportionately high burden of cervical cancer, partially due to increasing attrition rates at each stage of the screen-diagnose-treat process. This collaboratory will create a roadmap to leverage transformative technologies into a scalable delivery model that can reduce burgeoning cancer disparities, with a focus on cervical cancer. Researchers will identify challenges and strategies to shift procedures from specialists to primary care providers and/or reduce clinical visits; conduct a cost-benefit analysis of this approach; and establish the acceptance of this approach by both providers and patients, including a sustainable business model, using the Pocket Colposcope as an example. These grants support innovative faculty research in the humanities and social sciences—across and between all disciplines—that has successfully completed an initial phase of inquiry or preparation and has the potential to have broad and sustained impact. Funding ranges from $5,000 to $50,000 per project for one fiscal year. Linking health records with data on social determinants of health—such as socioeconomic status, education, physical and social environment, and employment—can improve predictions of health risks and provide personalized care. Building on a 2018 Data+ project, researchers will implement a pilot focused on Cabarrus County, N.C., home to Duke’s MURDOCK Study. The longer-term goal is to develop data resources on social determinants of health for use across a wide range of contexts, including linkage to research data as well as health record data. For almost three centuries, novels featuring individuals who leave their homes and struggle for a place in a changing world kept the myth of modernization alive, renewing its promise of a future state of economic plenitude. The novels written for today’s global book market overturn this narrative in order to tell a story in which economic progress disrupts the daily life of entire communities, forces them from home and nation, and keeps them on the move. Researchers will produce a collection of articles to identify the form and scope preliminary to explaining the cultural implications of the global imagination. Opioid addiction, misuse, and overdose have increased dramatically in the U.S. An important characteristic of this national health crisis is that many addictions and deaths can be traced to legal and justifiable prescriptions written by healthcare providers. This project explores how provider networks, a powerful but understudied influence, shape prescribing behavior. Researchers aim to use a unique Duke University Medical System dataset to study network relations and prescriptions; collect data on networks external to DUMS and explore how they interact with Duke networks to influence prescriptions; and study how the association between networks and opioid prescriptions responds to policy changes. High-quality data on the locations and characteristics of energy infrastructure greatly facilitate effective energy policymaking, management, and modeling. However, these data are frequently scarce, incomplete, or unreliable. This project will develop a platform that leverages recent breakthroughs in deep learning to scan global-scale remote sensing data in order to extract such information at unprecedentedly high geospatial resolutions, and to make those data resources publicly accessible. 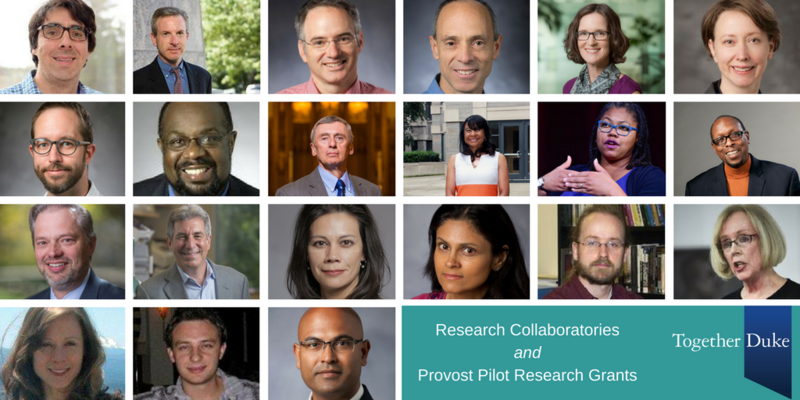 Researchers will demonstrate the efficacy of this approach to explore several novel research questions in the social sciences, in collaboration with Duke researchers and external partners. To improve health and nutrition outcomes among pregnant women, lactating mothers, and children under five, the Government of India launched the Pradhan Mantri Matru Vandana Yojana in 2017 to provide a conditional cash transfer to first-time pregnant women and new mothers. While conditional cash transfers are a common policy tool, we lack a clear understanding of how they impact health and nutrition outcomes. This project will conduct monitoring and evaluation of this program in the state of Madhya Pradesh. Read the academic strategic plan, Together Duke: Advancing Excellence through Community. See other Together Duke initiatives. View the 2018 recipients of Duke’s Intellectual Community Planning Grants to begin or test a new collaboration around a shared interest.